Munchkin (our 6 year old) had been begging me for pretzel dogs for some time, but I had no luck finding them in the stores (probably a good thing, I'm sure the list of ingredients would not be to my liking:). Fortunately for all of us, I discovered a recipe on Pinterest from Cheerios and Lattes for homemade pretzel dogs. So for our July 4th fete, we made our own. My food processor is great for making dough! Slowly add yeast mixture. Using dough setting knead for 5 minutes. Place dough in bowl and cover with damp towel and let rise for about 1 hour. Return dough to mixer and knead for another 5 minutes. Let rise for another 45-60 minutes until dough has doubled in size. Preheat oven 450 degrees F, and prepare baking sheet with parchment paper or light coat of grapeseed oil. 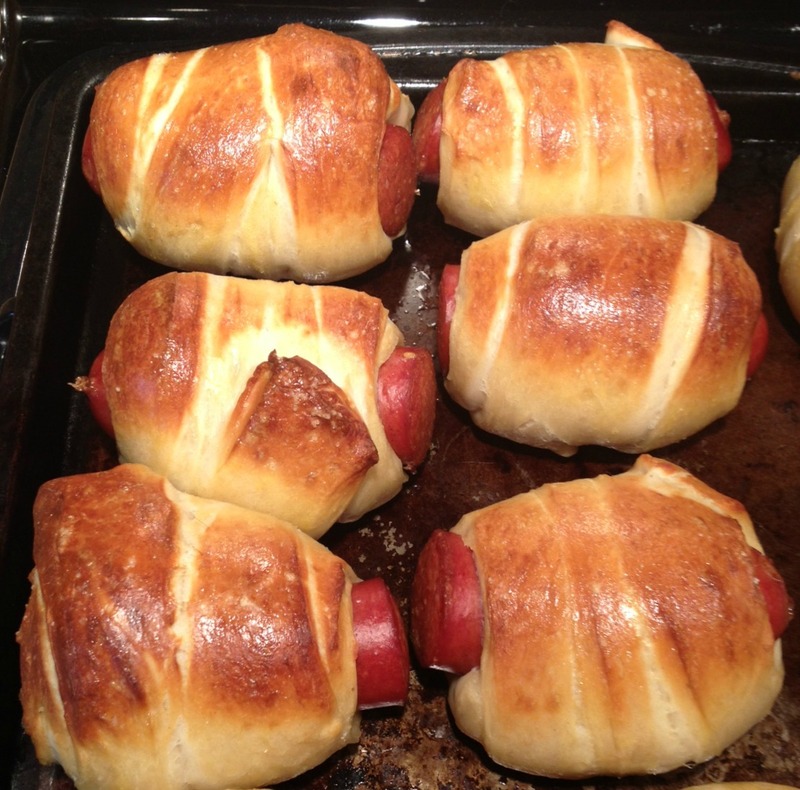 Drop 2 or 3 dough-wrapped hot dogs into the boiling water for 30 seconds. My husband, Kovas took care of the boiling. Arrange the boiled hot dogs on the prepared baking sheets. Brush each pretzel dog with the egg yolk mixture, and sprinkle with salt. These homemade pretzel dogs did not disappoint, and as long as you allow enough time for the rises, the recipe is really pretty easy! These were so good, and pretty simple, fun to make them as a group!